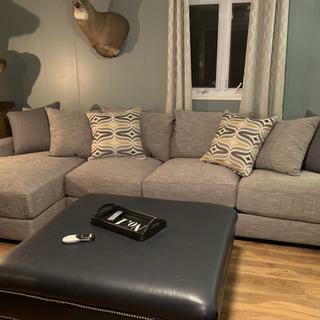 L: 39" x W: 64" x H: 37"
Includes right-arm-facing loveseat and left-arm-facing chaise. Originally it’s a great, plush couch. That lasts a couple of months. Very soon after purchase the true poor quality of the couch became apparent. The cushions quickly lose their formation and crater in the creases. We haven’t owned this couch for a year and I already dread using it. If you plan on using this couch somewhat regularly, I would look elsewhere. The grayest, plushiest sofa ever! This sofa was my boyfriends and mines first purchase of furniture and we are in LOVE with it. It was beyond what we were expecting when it was delivered. So plush, and comfortable. The colors were everything we wanted in our living room, could not have asked for a better piece of furniture or choice. We love this couch and would recommend it to anyone who asked. If comfort is your main concern. You found your match. Wow.. im all about the comfort, more so than style, BUT, this couch looks great and feels even better. The cushons are ridiculously comfortable. Just got it today but i can not sit on it without falling asleep. Perfect! We loved this couch when we saw it in the store. Even more so when it got delivered and we immediately fell into it and felt like we were sitting on clouds. We got compliments from anyone that sat on it how they loved it. Fast forward 6 months later and the cushions have completely lost all form. When you sit, it feels like you’re just sitting on the frame. We are so incredibly disappointed that we spent money for something that hasn’t even held up for a year. And forget the “Platinum Warranty,” it’s completely useless. Don’t let the appearance and original comfort fool you, this couch is not worth it. This product was beautiful in the store and so comfortable. The only good thing about this product was that it was delivered on time, other than that I am not pleased. The Big Comfy Couch ! Plush, comfy and just what we were looking for ! The color was a perfect match for our living area and we may even look to add ! Thanks our favorite salesman Alan who knew exactly what we wanted ! Buy it ~! Absolutely love this couch. It is well built and stylish as well as immensely comfortable. Hard to find all those components together. Great set up, comfy couch, best price around. Most comfortable couch EVER! We love it so much and now spend all of our time in our living room. Me and my fiance can both lay fully extended on this couch and not bump each other--so comfortable and cozy. LOVE! This couch is great. It is super comfy, and the material is very soft. On the couch with a sore neck and stiff body, instead I feel good and roll over and sleep some more!! I recommend this couch to anyone looking for a comfy place to relax and read, watch tv, or just relax. We love our sectional, it’s exactly what we wanted. Super comfy, super deep cushions. Great durable fabric! Couldn’t be happier with our purchase! We love our sectional it’s exactly what I wanted and was looking for. Super comfy! I LOVE this sofa. It is so pretty and looks so expensive. it def makes my living room look much better than it could be. It is also super comfortable. It you remove all the pillows, it is almost the size of a twin bed! I now lay on my sofa even longer than before. it is both pretty and comfortable. a very successful purchase!! Do not purchase this couch!!!!!! After three months the cushions and fabric looked to be about 10 years old. The Platinum Protection plan does not help either as I just tried to get the cushions replaced and was told they don’t cover that, that’s manufacturer. All around awful couch and worse customer service. This couch is the best purchase I made! It is so comfy and stylish. Everyone who sits on it loves on comfortable it feels. Highly recommend! Can't beat the price!! I sat on this couch and could not imagine NOT having it in my home. My sales guy, Walter, was AWESOME! I am so happy with the decision to purchase this couch! This was perfect for our needs! It's really comfortable and fits two people easily - in all sorts of configurations! We’ve only had this for less than a week, but we LOVE it! We’re constantly fighting with our cat for the chase. He’s a big fan, too. I love this chair it is so comfortable.... What more can you ask for? Can you purchase replacement cushions? Can you purchase just the chaise ? BEST ANSWER: Hello Ava, the chaise piece can be purchase by contacting online sales at 866.383.4484, option 2. Yes, the chase and couch attach and detach via oversized industrial clips. This was a great buy. Be careful you just might melt on it more than you think. Can the chaise be on the right ?? BEST ANSWER: Yes. We do offer the reverse configuration. What colors can I choose from ? BEST ANSWER: The Leighton Sectional Sofa is available with the upholstery shown only. There is only one color option as shown in the pictures. I’ve went to see this couch in the store and love everything about it besides the few reveiws stating the cushions go bad - do not hold form after 6 months which does not suit me well. If they do will r and f replace them? Do I have to buy the warranty for that? BEST ANSWER: Hello David, thank you for your interest in the Leighton 2-pc. sectional sofa! We recommend purchasing our Platinum Protection coverage to all customers. Please refer to our furniture and mattress coverage https://www2.raymourflanigan.com/platinum-protection.html Our online sales associates would be happy to answer any questions you have about the coverage as well. For assistance, please contact 866.383.4484, option 2. 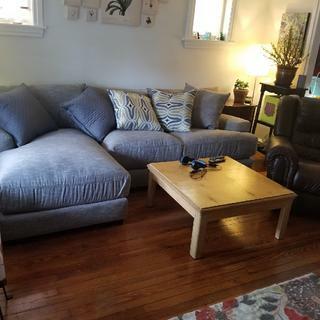 Is there a matching chair to go with this couch? BEST ANSWER: Hello Lindsay, thank you for your interest in the Leighton 2-pc. Sectional Sofa! This collection does not include a matching chair. We do offer a variety of living room chairs and accent chairs that are different shades of grays and patterns. can i add a 3rd middle section to this style? BEST ANSWER: Yes. It would be possible to add an additional sectional piece to the Leighton 2-pc. Sectional Sofa. You can either visit your local showroom or contacting our online sales department, 866.383.4484, option 3! I have this couch. Some of the cuchions have already begun to pile which is VERY disappointing considering we’ve only had it less than 6 months. would like to know how to clean the fabric overall. Since the cushion covers are all removable Would they be safe on delicate cycle in washer? BEST ANSWER: Hi Rachel! This fabric has a cleaning code of W which means to clean only with water-based shampoo or foam upholstery clearner. Do not over wet. Do not use solvents to spot clean. Pile fabrics may require brushing to restore appearance. Cushion covers should not be removed and laundered so no, I would not recommend washing these, even on a delicate cycle. Is this fabric pet friendly and does it pill? BEST ANSWER: This sectional sofa is made up of chenille upholstery: 89% Polyester / 11% acrylic. This woven fabric is soft to the touch yet durable enough for extensive, everyday use. Proper use and using the recommended cleaning care, leads to a long lasting sofa. Can the legs be changed to longer legs? BEST ANSWER: While the legs are changeable to something longer in height, we don't recommend changing our furniture. In addition, longer legs are not available via R&F. Do the two sections connect? BEST ANSWER: Yes. The Leighton 2-pc Sectional Sofa does include connectors. What are the size of the throw pillows if I'd like to get them covers? BEST ANSWER: The pillows measure 23" X 23". Does this couch come in a sofa and love seat ? BEST ANSWER: The Leighton is available as a sectional only. hi is this couch on display at the warwick r.i. store? BEST ANSWER: The Leighton Collection is on display at the Warwick, RI showroom.